We’d love your help. Let us know what’s wrong with this preview of Stone Girl, Bone Girl by Laurence Anholt. To ask other readers questions about Stone Girl, Bone Girl, please sign up. I do apologise to especially my Goodreads friends who have found Laurence Anholt's (author) and Sheila Moxley's (illustrator) Stone Girl, Bone Girl: The Story of Mary Anning a sweet and engaging tale, but truth be told, I have not much enjoyed the illustrations and have actually and in fact totally and utterly DESPISED the narrative, the story itself, or rather, I should say, the misleading and strangely fantastical manner in which author Laurence Anholt has chosen to present the very much impor I do apologise to especially my Goodreads friends who have found Laurence Anholt's (author) and Sheila Moxley's (illustrator) Stone Girl, Bone Girl: The Story of Mary Anning a sweet and engaging tale, but truth be told, I have not much enjoyed the illustrations and have actually and in fact totally and utterly DESPISED the narrative, the story itself, or rather, I should say, the misleading and strangely fantastical manner in which author Laurence Anholt has chosen to present the very much important account of Mary Anning and her fossil discoveries. As aside from the fact that the author has for no in any manner understandable reason whatsoever failed to even mention Mary Anning's older brother Joseph (with whom she had a very close relationship and who actually was the person to originally discover a "dragon eye" in the cliff, which of course was later unearthed by his sister Mary as the first fossil of an ichthyosaur), the whole story of Pepper's death is pretty much and sadly lacking. Why is it not mentioned that Mary Anning's father suffered a serious back injury whilst collecting curiosities on the beach and that his later death due to tuberculosis was directly related to the former, to said accident? For how Pepper's death is described in Stone Girl, Bone Girl: The Story of Mary Anning sure does make it appear as though Laurence Anholt absolutely wants to convey that Mary Anning's father simply died of old age and due to cold, damp weather, which was simply not the case. But much much worse, and yes, the main reason why I am ranking Stone Girl, Bone Girl: The Story of Mary Anning so low and why I am in fact rather angry and majorly so is that the whole fantastical sequence involving Mary Anning's dog is both cringeworthy and in my opinion quite insulting (for while the author creates a sweet and fantastic little rigamarole where the little dog seems to almost if not probably represent the dead father's, Pepper Anning's spirit, coming to help Mary unearth her itchyosaur fossil only to then disappear because his purpose is now done, the truth of the matter, the tragic truth, is that in reality, Mary Anning's dog was killed in a rockslide, an event that greatly saddened her, an event that was yet another of the many tragedies she had to endure as a child and I for one consider how Laurence Anholt has incorporated, has used the dog at best rather childish and actually also massively disrespectful to Mary Anning and the sad truth that she had to weather and endure so many personal tragedies during her life, but still managed to persevere and succeed). Every month the Children's Books group's Picture Books Club reads 6 books that have a theme. July’s topic is dinosaurs. I’d already read the other 5 books when I was finally able to pick up the 6th book today, this book. I’m so grateful this book is one of the selected books because I think it is exceptionally good and I really enjoyed it. It’s the story of an English girl, born in 1799; she lived in Lyme Regis, England, and at a tender age found a fossil of significance, and then went on to dis Every month the Children's Books group's Picture Books Club reads 6 books that have a theme. July’s topic is dinosaurs. I’d already read the other 5 books when I was finally able to pick up the 6th book today, this book. I’m so grateful this book is one of the selected books because I think it is exceptionally good and I really enjoyed it. It’s the story of an English girl, born in 1799; she lived in Lyme Regis, England, and at a tender age found a fossil of significance, and then went on to discover other important fossils. It was a highly unusual activity for a girl during that time. The story is wonderful. I’m eager now to read a biography of this woman, a book written for adults. This book is terrific for kids. It shows that children (Mary was only 12 when she made her famous find) can do important things. It also would be a terrific book to read as a group book and then have a discussion about bullying. I love how this book shows how Mary was unusual from the start, having been the only survivor of a lightning strike when she was a toddler, having a father who introduced her to searching for “treasures” at a young age, how neighbor sisters helped fuel her interest, and how she persevered in her highly atypical activities of searching for fossils, which played a role in the then new science of evolution. Mary’s father dying was certainly a sad moment but, even though she wasn’t as perturbed, I found the disappearance of her companion dog much more distressing. "Stone Girl, Bone Girl" is a brilliant biography about Mary Anning, who was known for digging up extraordinary fossils back in her day. In this tale, Mary Anning loved digging for strange rocks called "curiosities," but when she meets the Philpot sisters, who were famous scientists, they told Mary that the "curiosities" were actually fossils and that one of the fossils, that belong to a giant sea monster, is the greatest treasure of all. Will Mary find the fossil of the giant sea monster? Read t "Stone Girl, Bone Girl" is a brilliant biography about Mary Anning, who was known for digging up extraordinary fossils back in her day. In this tale, Mary Anning loved digging for strange rocks called "curiosities," but when she meets the Philpot sisters, who were famous scientists, they told Mary that the "curiosities" were actually fossils and that one of the fossils, that belong to a giant sea monster, is the greatest treasure of all. Will Mary find the fossil of the giant sea monster? Read this book to find out! Laurence Anholt has done a fantastic job at telling the story of Mary Anning's adventures in finding the fossils of the giant sea monster. Laurence Anholt makes this story dramatic and emotional at the same time, especially during the scene where Mary Anning was struck by lightning as a baby, but survives, which I found to be truly amazing since I have never heard about a baby being struck by lightning and surviving the accident. What made this book truly worth reading was the fact that Mary was engaged in an activity that was not common for children to do back then and I loved her devotion to collecting fossils, since I love collecting various items also and I can relate to her devotion in collecting fossils. Sheila Moxley's illustrations are colorful and beautiful at the same time as the characters look lively, especially of the image of Mary Anning herself as she wears a brown and white dress, indicating that she is an adventurer. Sheila Moxley also makes her illustrations somewhat chaotic, especially of the images of the houses in Mary Anning's neighborhood as they look disordered, but they give this book a creative look. Really my four stars are for the story of Mary Anning herself -- the narration is fine but nothing special, and the illustrations, while interesting, seemed a somewhat odd choice to accompany a story set in early-nineteenth-century England. This was a great read! The illustrations were perfectly drawn to set the mood of the story. I found myself right there in the 1800's! I was very intrigued by this story, as I knew nothing about Mary Anning or where Lyme Regis was. I also always wondered about that little rhyme I use to sing as a child and was fascinated to find out where it came from. (She Sells Sea Shells) That is such a hard tongue-twister! There was a lot of information packed in this children's book; from a birth to a death This was a great read! The illustrations were perfectly drawn to set the mood of the story. I found myself right there in the 1800's! I was very intrigued by this story, as I knew nothing about Mary Anning or where Lyme Regis was. I also always wondered about that little rhyme I use to sing as a child and was fascinated to find out where it came from. (She Sells Sea Shells) That is such a hard tongue-twister! There was a lot of information packed in this children's book; from a birth to a death and then to a new life. I enjoyed Mary’s story about how at such a young age she became a remarkable part of science. I think it is important for children to know it is okay to be different and how they too can do something wonderful. Struck by lightning as an infant, Mary Anning was an unusual young girl from the very beginning, but it was her father's gift of a "snakestone," found in the clay cliffs near their home in Lyme Regis, that set her on the path that would truly make her stand out. Fascinated by the beautiful "treasure," she set out to find more, spending so much time on her new hobby that the local children made up a rhyme about her: "Stone girl, Bone girl. Out-on-your-own Girl." Despite the ridicule of her peers, Struck by lightning as an infant, Mary Anning was an unusual young girl from the very beginning, but it was her father's gift of a "snakestone," found in the clay cliffs near their home in Lyme Regis, that set her on the path that would truly make her stand out. Fascinated by the beautiful "treasure," she set out to find more, spending so much time on her new hobby that the local children made up a rhyme about her: "Stone girl, Bone girl. Out-on-your-own Girl." Despite the ridicule of her peers, and the eventual death of her father, Mary kept at it, encouraged by the Misses Philpot - two neighbor ladies who exposed her to some of the scientific thinking about the fossils she was finding - and eventually her persistence paid off, with her discovery of the very first complete ichthyosaur skeleton, in 1811. The kids and I are studying Mary Anning. We've read a couple of versions of her story. This one is well-told and illustrated, but not my favorite -- mostly because some of the major points of Mary's story are left out or changed (most curious is her brother's unnecessary absence). But I do appreciate that this one brings in the Philpot Sisters, which some others do not. I really enjoyed this book. It was interesting hearing about Mary Anning's life and where her interest in fossils came from. There are interesting elements of bullying and teasing which could be used as great teaching tools. Stone Girl, Bone Girl: The Story of Mary Anning is a wonderful picture book biography of a twelve year old girl and her dog who discover a fossilized full skeleton of an Ichthyosaur in the cliffs above her home in Lyme Regis. The story opens with a dramatic event in which Mary is struck by lightning as a baby. The fictional account of Mary Anning's life creates a comfortable view of family life with her father igniting her passion for all things fossil related. 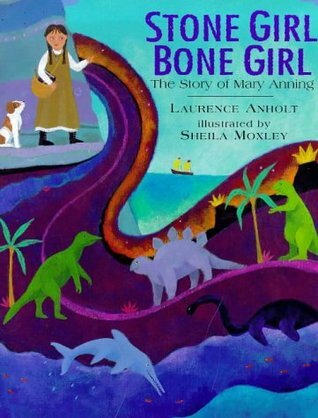 After the death of her father 'Pep Stone Girl, Bone Girl: The Story of Mary Anning is a wonderful picture book biography of a twelve year old girl and her dog who discover a fossilized full skeleton of an Ichthyosaur in the cliffs above her home in Lyme Regis. The story opens with a dramatic event in which Mary is struck by lightning as a baby. The fictional account of Mary Anning's life creates a comfortable view of family life with her father igniting her passion for all things fossil related. After the death of her father 'Pepper' Mary goes on to set up her own fossil shop with the help of the Philpot sisters who are alleged scientists. She then of course goes on to make the remarkable discovery for which she is renown for. Laurence Anholt provides a short closing note on Anning's place in paleontology and goes on to claim that she is the focus of the traditional rhyme "she sells seashells by the seashore." Sheila Moxley's bright, folky illustrations are rife throughout the book, following the journey of Mary, which make it both pleasing and child friendly. This book can be read out aloud to a class as part of guided reading and also be the focus of biography writing within class. This story can also re-enacted in class or form the basis of a class assembly. This is a bittersweet tale about a young girl who helped to discover many different fossils. The sad circumstances of her childhood are certainly disturbing and I would recommend this book for older children. The bullying that she endured was only tempered by the silence of her tormentors when she became famous for her discoveries. The sh This is a bittersweet tale about a young girl who helped to discover many different fossils. The sad circumstances of her childhood are certainly disturbing and I would recommend this book for older children. The bullying that she endured was only tempered by the silence of her tormentors when she became famous for her discoveries. The shells she sells are seashells I'm sure. I'm sure the shells are seashore shells." The illustrations are very colorful, but often appear very abstract and somewhat disturbing. Certainly not my favorite. But the story is interesting and we really enjoyed reading this book together. In Year 5 we are currently covering the topic of Mary Anning, so we used this children's story book which tells of her first Fossil find in 1811 in a child friendly manner. May Anning was born in 1799 in Lyme Regis, Dorset. She got struck by lightning at the age of one then went on to discovered the fossil of an Ichthyosaur. Although this story has been edited to be suitable for children, it has many of the facts embedded in it. The illustrations are good and weird at times but adds to the charact In Year 5 we are currently covering the topic of Mary Anning, so we used this children's story book which tells of her first Fossil find in 1811 in a child friendly manner. The illustrations are good and weird at times but adds to the character of the book! Did not like the primitive illustrations. The story of Mary Anning's life, with beautiful striking illustrations. Does not shy away from the issues in her life but equally does not dwell on those issues. Used to teach children about Mary Anning's life, with KS1 i adapted the story as the book is incredibly wordy and would not have held my youngest children's attention. The story itself is more suited to KS2. I kept the illustrations and the children made additional inferences based on these. The older children had a look at the book on The story of Mary Anning's life, with beautiful striking illustrations. Used to teach children about Mary Anning's life, with KS1 i adapted the story as the book is incredibly wordy and would not have held my youngest children's attention. The story itself is more suited to KS2. I kept the illustrations and the children made additional inferences based on these. The older children had a look at the book on their tables and were entirely engrossed by it. The story really inspired the class, many of whom went off fossil hunting as soon as they had a chance. This book was followed up with a visit from "Mary Anning" in which children demostrated their knowledge and extended their learning using excellent questioning skills. Lovely book to compliment a topic on dinosaurs and looking at the interesting life of Mary Anning. Great for cross curricular opportunities. I enjoyed the style of this book and how it was presented. But, I think a more detailed afterword would have helped give the reader a more complete sense of Mary Anning's life. Real childhood favourite. :) Mary Anning is my absolute hero. Can't believe she's apparently such an obscure historical figure! 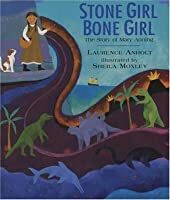 Stone Girl, Bone Girl tells the story of Mary Anning, an extraordinarily prolific fossil hunter born in England in 1799. When Mary began fossil hunting, she did not understand the significance of what she was finding. She was just hunting for curiosities, which she could sell to tourists in Lyme to make a bit of money for her extremely poor family. Her first major find came at the age of 12, when she uncovered an ichthyosaur. Over the years as she continued to hunt in and around the cliffs of Lym Stone Girl, Bone Girl tells the story of Mary Anning, an extraordinarily prolific fossil hunter born in England in 1799. When Mary began fossil hunting, she did not understand the significance of what she was finding. She was just hunting for curiosities, which she could sell to tourists in Lyme to make a bit of money for her extremely poor family. Her first major find came at the age of 12, when she uncovered an ichthyosaur. Over the years as she continued to hunt in and around the cliffs of Lyme Regis, Mary Anning found hundreds of fossils, including plesiosaurs, pterosaurs, and several more ichthyosaurs. Although she herself never left Lyme Regis, the fossils Mary found made their way to museums worldwide and contributed to the work of many of the major scientists of the day. Among them was Charles Darwin, who used her fossils to help develop the theory of evolution, which he described in his book, On the Origin of Species, published in 1859. I found this book nearly as interesting as my daughter, and so, didn't mind reading it to her as many times as she asked. My daughter loved that Mary Anning found her first important fossil at the tender age of 12. I love that she hunted for it despite being laughed at by the other children, and that she persisted in fossil hunting even though it was an odd thing for a woman, much less a 12-year-old girl, to do in early 19th C England. And we both enjoyed the illustrations, which are dramatic and imaginative. That said, many details of Mary Anning's life obviously had to be compressed or omitted altogether to fit the 24 pages allotted to it. What is told is told well, and left both of us wanting to know more about this remarkable woman. And that, in the end, is what you want a biography written for children to do. Mary Anning's discoveries are awe-inspiring when one reads about the small village in which she lived and the risk to those climbing the cliffs in which her first discovery was made. This picture book biography captures her life and her discoveries for the young reader. While I'm sure the face of despair that Mary wears through the book in the illustrations may reflect her rather solitary existence, what little girl would want to be like her if she always looks miserable? story of Mary Anning born in 1799. Loved to dig for stone shapes in cliffs of Dorset, England.Discovers fossils and searches for remains of great sea monster.At 12 years old Mary makes one of the most important scientific discoveries of her time. This is the story of Mary Anning, who endured bullying and bereavement, but found an Icthyosaurus fossil and confounded the expectations of those around her. It's an inspiring read and beautifully illustrated, though it is a long read for kindergarten ages. I'd suggest reading at home over a few nights with older K2s to really appreciate this, although children do select it in our library because the pictures are so lively. A beautifully told biography with lovely illustrations and poetic word choice. This narrative follows young Mary as she discovers "curiosities" with her father that turn out to be the key to her and her mother's survival after his death and bring magic (or at least beauty) into her world in the wake of loss. This isn't the first book about Mary Anning that I've read, but I might have to call it the best I've read. This one let's the reader in on the backstory of Mary's life in a way that others I've read have not. I really liked the story and the end notes were also illuminating. If you want to know about Mary Anning, this is probably the best book from which to learn it. 6/15/11 ** Lyrical text and vivid illustrations combine to tell the story of Mary Anning, an early fossil hunter and self-taught expert on fossils. Focuses primarily on the early life experiences that led to Anning's scientific discoveries. A lovely tale about the childhood of renowned fossil finder Mary Anning who made huge contributions to science and our collective understanding of biology. An inspiring and interesting story for all, especially girls. We really enjoyed learning about this girl scientist! Even though the illustrations were a bit strange and the writing was a bit odd. It was especially weird how abruptly the death of Mary's father was handled. In a career spanning three decades, Laurence Anholt has produced over 200 children's books, which are published in more than 30 languages. Titles like the self-illustrated Anholt's Artists series have sold many millions of copies around the world. Laurence has also collaborated on numerous picture books with his wife, the artist, Catherine Anholt. Laurence's first YA / Crossover novel THE HYPNOTIST In a career spanning three decades, Laurence Anholt has produced over 200 children's books, which are published in more than 30 languages. Titles like the self-illustrated Anholt's Artists series have sold many millions of copies around the world. Laurence has also collaborated on numerous picture books with his wife, the artist, Catherine Anholt. Laurence's first YA / Crossover novel THE HYPNOTIST was published by Penguin Random House on 6th October 2016. The Hypnotist was described by The Bookseller as 'gripping, powerful storytelling with a powerful anti-racist message.' The book has been officially endorsed by Amnesty International, it was the winner of the Historical Association Young Quills Award, shortlisted for the Southern Schools Book Award and four major book awards. It is currently longlisted for the Carnegie Medal 2018. Born in 1959, Laurence Anholt was brought up mainly in Holland where he developed a lasting love of Art. He went on to study Painting for 8 years, culminating in a Master's Degree from the Royal Academy of Art in London. Catherine and Laurence live and work in a house on a hill with studios and wild flower meadows, overlooking the sea in Devon, southwest England. Laurence's books have won many awards, including the UK's prestigious Nestlé Smarties Gold Award on two occasions. For more than a decade, Laurence has been amongst the top 200 Most Borrowed Authors from UK libraries across all genres. He was included in the Independent on Sunday's Top 10 Children's Authors in the UK and was described by William Watt as "one of the most versatile authors writing for children today". Catherine and Laurence have been closely involved with a number of literacy schemes such as the UK Government funded Bookstart scheme. Their publication Babies Love Books (also a much-loved picture book) encourages parents to share books with babies from the earliest possible age. Their work has taken them inside Buckingham Palace and Downing Street on several occasions. Laurence's self‐illustrated Anholt's Artists series, is an introduction to great artists for young children. These beautiful books are used as part of the national school curriculum in many countries and are sold in galleries and museums all over the world. The books, which include Frida Kahlo and the Bravest Girl in the World, Camille and the Sunflowers, Degas and the Little Dancer and The Magical Garden of Claude Monet have taken Laurence on many fascinating journeys of discovery. Each scrupulously researched story is based on an actual encounter between a real child and a great artist. In several instances, Laurence has been assisted by relatives of the artists or by the protagonists themselves - for example, Laurence developed a long-standing friendship with Sylvette David, Picasso's Girl With a Ponytail. This series currently includes 10 titles and it has been adapted in many forms, including Apps for iPads, stage and TV productions and a full scale van Gogh musical which Laurence launched in Korea. The Anholt's Artists books are renowned not only for their educational value, but also for their life-affirming themes of aspiration, tolerance and acceptance of those who are different. Laurence Anholt is a much sought after public speaker, talking about literature and his own zany view of life at conferences all over the world. The Anholts have three grown up children, Claire and twins, Tom and Maddy. Claire is an anthropologist who works for the UN in Geneva, Maddy is an actor living in London and Tom is a successful artist based in Berlin. They also have twin grandchildren, Felix and Nina. Laurence Anholt's interests include art, literature, adventure travel and Buddhist meditation.